Fantasy icon pack with over 1.3K++ asset Update! comes with 32 x 32 and 16 x 16 pixel. Various icon for your games with 2 styles: background and non-background. Available with .Psd file ONLY with the iconset. 16 x 16 free sample here. 32 x 32 free sample link here. 141 Misc : Arrows, Medals, Frames, Etc. This is sick! I'll be buying this pack soon! I'm interested by these beautiful icons! Did you use a specific color palette for this work? Thanks. hello, thank you. I did not use specific color palette. I have already paid for it, why do I still need to buy it? 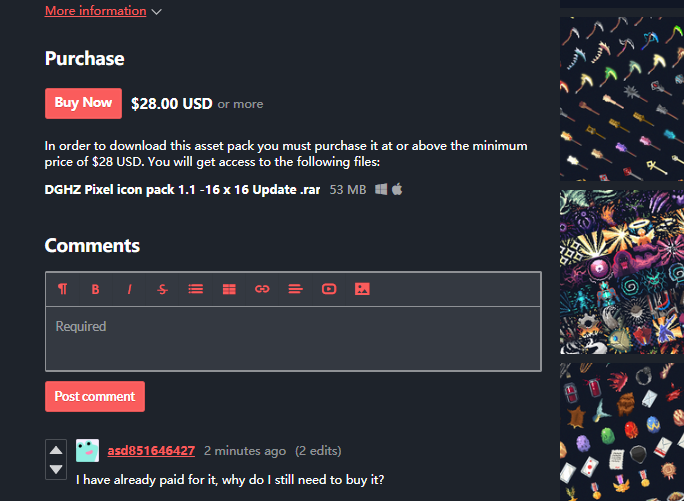 hello, if you already bought the asset, you can click the bottom most link that says "i already paid for this" you can read there for more info. Hey, man, I really like your resource pack, but my paypal balance is only 20.79USD. Can I buy it at 20USD? And does the same apply to your other work? Like tile sets and monster packs? Hello, yes you can use and alter all asset packs in your commercial projects. Absolutely worth money! Indeed enormous amount of stuff of different kinds - everything you need for a great RPG game or other! Beautiful and well-polished pictures, thank you very much for your work and keep it up! Thank you for your purchase. Stay tuned for my next work. hello, sorry for the misleading name. It's a 32 x 32 new update in addition to 16 x 16 px icon. so there are both 32 and 16 pixel asset in the pack. Awesome arts! I like this set very much and decide to use it in my games. I want to know what's the license of the set ? Can I use them on my commercial game ? Can I remix and build new assets upon them ? Good works. thank you very much for purchasing. Yes you can use them and remix in your commercial game. hello, this is all 32 x 32 and 16 x 16 icon set. These honestly look incredible :D.
However I'd like to ask as I couldn't find it referenced anywhere alongside the icons, does purchasing these allow for the use of them in commercial projects? E.g. Game project. Hello, sorry for the late reply. This icon has 195 skill icon. Hi, Thank you for your purchase. Unfortunately, i don't know whether i can update it or not. Stay tuned! Your "Buy Now" button states $28 USD, but you only allow the asset pack to be downloaded if we pay $29 USD or more. Please standardize it. I paid $28 USD and cannot download anything due to this. I will be opening a support ticket under itch.io. Hello. I'm terribly sorry for the alternative pricing. I already delete it now. Can i give it to you directly via e-mail? can you tell me your email address? Don't worry about it, I'm able to download it now, as you have reduced the minimum price to download to $28 USD. Awesome! Thank you for the purchase. Yes, i will update this icon pack soon. Look forward for my next update. Daaamn!! Great job dude! stuning. Best icon pack ever. I just purchased these and they are beautiful! Wow impressive! Do you have something similar in 16x16 ? Hello. Unfortunately, i don't have different size for now. I may update later, so look forward for my next update!